Street Fighter player Chris Hu may have lost everything in a fire, but the fighting-game community is banding together to try to help him get back up on his feet. 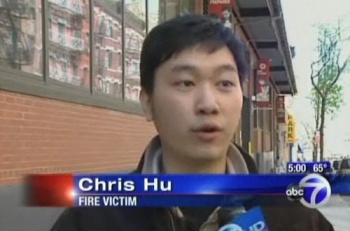 Chris Hu, an amateur Street Fighter commentator and member of the Shoryuken fighting game message boards, was the victim of a very tragic event: A fire in New York's Chinatown area consumed his family's apartment, leaving him and his family - and as many as 50 other families - homeless. To make matters worse, Hu told ABC News, his family lost their entire life's savings - as the report notes, many immigrants like Hu don't use banks. However, in a spark of silver lining to the otherwise dark cloud, the fighting-game community is banding together to take care of one of its own. Shoryuken is running a collection drive for Hu and his family, priming the pump by donating $1,000 out of its own coffers to get things started. From what we can see, the pot has grown steadily since yesterday, with some SRK members donating well over a hundred dollars - such as one particular Street Fighter fan, who donated precisely $133.70 for Hu's "leet commentary." While none of this makes the tragedy any less tragic - and certainly not for the families who don't have passionate communities who can help them recover - it always brings warmth to my cold, cold heart to see gamers banding together to help out someone in need. We gamers are a charitable bunch - just look at Child's Play. Best of luck, Chris. Let's all hope that a community known for its love of intricate combos can pull off a super move of charity. And if you've got a few extra bucks to spare, why not send them Chris Hu's way?